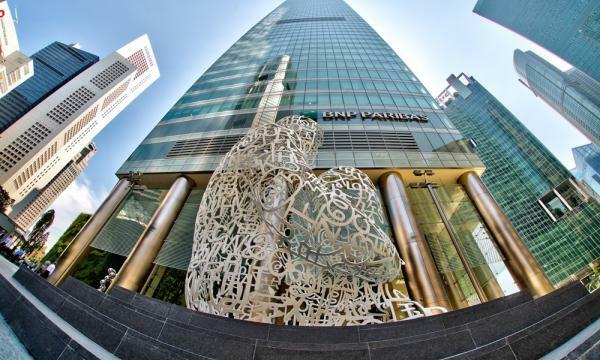 Local payment performance rebounded for the first quarter of 2019, following three consecutive quarters of decline, the Singapore Commercial Credit Bureau (SCCB) revealed. Prompt payments, which refers to when 90% or more of total bills are paid within the agreed payment terms, increased to slightly more than half of the total payment transactions whilst slow payments, or those that refer to less than half of total bills paid within the agreed terms, accounted for more than one-third of total payment transactions. “The rebound in payment performance should come as no surprise given that slow payments have been on a decline since Q4 2018. With the exception of the construction sector which has seen worsening debts from the previous quarter, the remaining sectors have experienced a decrease in slow payments. However, compared to the same quarter in 2018, we have noted a slight increase in payment delays. This could be attributed to tightening cashflows and a generally dimmer outlook among firms here.” said D&B Singapore CEO Audrey Chia. Prompt payments increased by 7.87ppt from 43.83% in Q4 2018 to 51.70% in Q1 2019. On a year-on-year basis, prompt payments inched up marginally by 0.5ppt from 51.20% in Q1 2018 to 51.70% in Q1 2019. Slow payments decreased by 1.43ppt from 38.02% in Q4 2018 to 36.59% in Q1 2019. 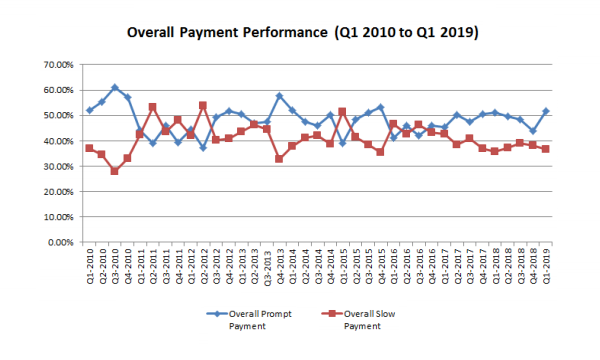 Year-on-year, slow payments increased by 0.85ppt from 35.74% in Q1 2018 to 36.59% in Q1 2019. Meanwhile, partial payments or those between 50% and 90% of total bills paid within the agreed payment terms fell visibly by 6.44ppt from 18.15% in Q4 2018 to 11.71% in Q1 2019. Y-o-y, partial payments dipped slightly by 1.35ppt from 13.06% in Q1 2018 to 11.71% in Q1 2019. From a sectoral perspective, QoQ slow payments have improved across four industries. Construction is the only sector which experienced an increase (+4.49ppt) in slow payments. Meanwhile, slow payments in the manufacturing sector dipped 2.33ppt. Declines of 4.02ppt were seen for retail, 1.50ppt for services, and 1.39ppt for wholesale.